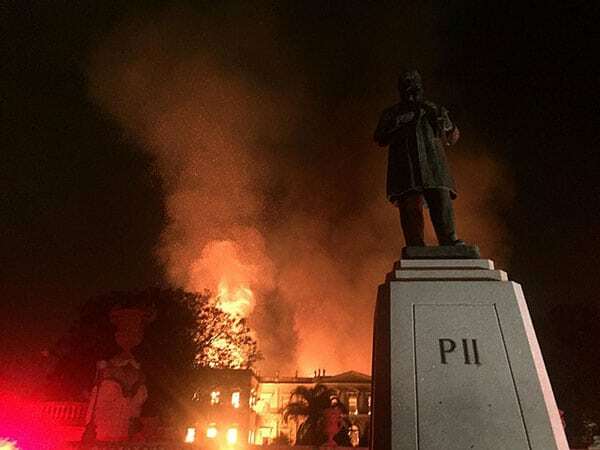 A massive fire consumed the 200-year-old National Museum of Brazil in Rio de Janeiro last Sunday evening after visiting hours. Except for the Bendegó Meteorite, which has endured worse, nearly all of the 20 million priceless items spanning 11,000 years of international history are feared lost to the out-of-control fire that raced through all three floors of the largest natural history museum in Latin America. The most grievous losses include the destruction of indigenous text and sound material documenting indigenous language that are disappearing and artifacts from the country’s pre-Columbian era. Egyptian and Greco-Roman relics and the oldest human skull found in the Western hemisphere, known as “Luzia,” were also caught in the fire. Anthropologist Mércio Gomes said the fire was as bad as or worse than the one that swept through the royal library in Alexandria, Egypt, in 48 B.C.—a symbol of great and terrible loss of human knowledge. “We Brazilians only have 500 years of history. Our National Museum was 200 years old, but that’s what we had, and what is lost forever,” he wrote on Facebook. While museums worldwide offer condolences, recriminations fly within Brazil. Years of austerity measures and consequently inadequate fire protection systems are cited as the most common causes for the catastrophe. An electric fault or a sky lantern, common in Brazil, accidentally landing on the building may have sparked the fire. The Associated Press reports that the fire department “got off to a slow start” because of malfunctioning fire hydrants; fire trucks were forced to retrieve water from a nearby lake. Dozens of museum employees joined in the fight against the flames. Marina Silva, a former environment minister and candidate in the upcoming presidential election, called the fire “a lobotomy of the Brazilian memory.” The nation is preparing for national elections in October after years of infrastructure challenges and budget deficits. Hundreds of protesters stood at the gates of the museum’s smoldering ruins on Monday calling on the government to rebuild. Police in riot gear responded to some of the protesters with batons, pepper spray, and tear gas.